We’ve brought the classic CDV-700 cold war Geiger Counter right up to date with this exclusive miniature speaker module. Not only does it generate clicks through its loud built-in piezo speaker, we’ve also added a super bright LED flasher. The module is powered by three readily obtainable LR44/AG13 button cells (included) and it comes with one of our exclusive 3.5mm jack adaptor plugs that fits the standard Amphenol screw-fit headphone connector used on CDV-700s, so no modifications are required. You can also use the adaptor to connect your regular headphones or PC to the CD V-700. It also comes with a Velcro fastener strip, so you can attach it securely to the top or side of your Geiger Counter, without damaging it or making any holes. It’s a really compact design, measuring approximately 65 x 30 x 16mm and weighs only 40 grams. It’s finished in CDV yellow, with an authentic CD logo on the front. There’s an on-off switch on the side and the batteries should last several weeks or months with normal intermittent operation. Speaker volume is set loud enough to be heard, even in a noisy environment. It has been tested on all popular CD V-700 modules, including 6A/B variants made by ENI, Victoreen, Lionel and Anton (it should work on others too but if in doubt please email us before ordering so we can check). N.B. 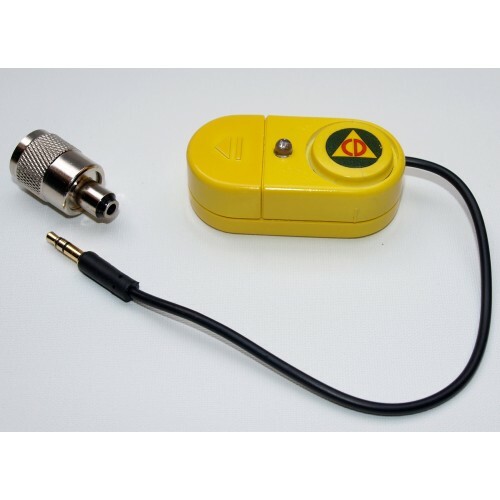 Although our Speaker Modules were originally designed for use with CDV-700s we have found that they can work well with other popular makes and types of Geiger Counter, and plug in directly on instruments fitted with 3.5mm headphone output jack sockets (we can also supply other types of adaptor). Contact us if you are unsure but if you want to take a chance we'll happily issue a full refund if your instrument turns out to be incompatible. Simply return the module to us in its original condition. You can't say fairer than that!